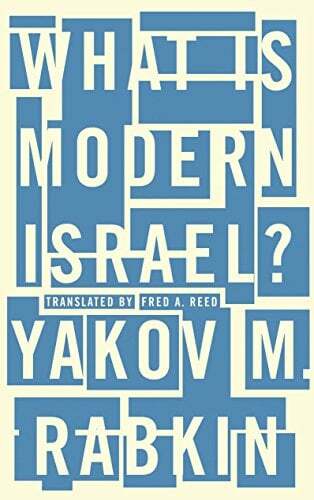 This is an interview I conducted with Professor Yakov M. Rabkin of the Université de Montréal, author of the recently published What Is Modern Israel. Professor Rabkin’s earlier book on the subject of Israel, entitled A Threat from Within: A Century of Jewish Opposition to Zionism, was nominated for the Governor General’s Literary Award and for the Hecht Prize for Studies of Zionism. Given all of the books that have been published over the years regarding Israel, what compelled you to write What Is Modern Israel? My Tokyo publisher. Impressed by the success of the Japanese version of my earlier book, A Threat from Within: A Century of Jewish Opposition to Zionism, in his country (it was listed as the best non-fiction book by the prestigious daily Asahi Shimbun), he asked me to write about modern Israel. It was to be a shorter and more accessible book, aimed at young readers. In A Threat from Within, I had examined the reasons why Zionism was initially rejected not only by rabbis but also by the vast majority of Jews. In the present book I had to go further. I had to spell out the origins of Zionism, including religious ones, to look at the evolution of Israeli society and its relations with world Jewry, as well as at the roles played by Jews from Russia. The Russian dimension explains many aspects of contemporary Israel that remain otherwise puzzling. What exactly do you mean by “the Russian dimension”? While Theodor Herzl, the founder of political Zionism, was meeting kings and ministers, Jews from the shtetls in the Russian Empire formed the backbone of Zionist settlement in Palestine at the turn of the 20th century. Subsequently they entrenched themselves in positions of leadership. Even though the Soviet Union did not allow emigration from the 1920s on, over 60 per cent of the members of Israeli parliament in the 1960s were of Russian origin. There has never been a prime minister in Israel who was either not born in the Russian Empire, or whose parents were. Moreover, a million Russian-speaking Jews settled in Israel in the late 20th century. They are mostly estranged from Judaism; they consider themselves of “the Jewish nationality” and are therefore quite unabashed about ethnic nationalism and the use of force to impose it. Most of them vote for the right and the extreme right parties. Their success in penetrating the highest echelons of power and moving Israeli politics to the nationalist right has been impressive. The recent appointment of Moldova-born Avigdor Lieberman as minister of defence illustrates this accomplishment quite convincingly. In your book, you delve into the impact of Christian Zionism on the birth of the Israeli state. Is that impact limited only to the early stages of the Zionist project? No, the role of Christian Zionism did not end with the Balfour Declaration in 1917 or the unilateral proclamation of independence by David Ben-Gurion in 1948. True, certain interpretations of Paul’s Epistle to the Romans argued for the “ingathering [of] the Hebrews” into Palestine as early as the 17th century. This affected the public imagination in the English-speaking countries, particularly those with anti-Semitic prejudices who wanted to get rid of local Jews. This mind-set is clearly reflected in the Balfour Declaration. This Christian motivation for the Restoration of the Jews in the Promised Land lent a powerful practical impulse to a group of assimilated Jews in Central and Eastern Europe in search of a collective “solution of the Jewish question.” The Judaic hope of Return had been traditionally characterized by an entirely different sensibility and ultimate goal. Jewish tradition holds that this return must be a part of a messianic project rather than a political and a military enterprise. In fact, there was little room for Jewish tradition in the Zionist scheme, which not only originated among Protestants, but was sustained by individuals of Jewish origin who were mostly atheists or agnostics. A recent Pew poll shows that 82 per cent of white Protestants in the United States believe that “Israel was given to the Jewish people by God.” Only 40 per cent of Jews do. This is why Christian Zionists constitute a much more reliable source of political and financial support for Israel than Jews. Recent Israeli governments and settlers in the territories, which Israel conquered in 1967, have developed close ties with major organizations such as Christians United for Israel. Its leader, Pastor John Hagee, claims that his organization represents 50 million people. This is nearly four times more than the entire Jewish population of the world, which is estimated at 14 million. And one should also take into account the millions of Christian Zionists in Latin America, South Korea, Canada, Australia and New Zealand. What do you make of Israel’s claim that it represents all of the world’s Jews? Can you elaborate on the distinctions between Judaism and Zionism? The Jews of Israel constitute about one half of the world’s Jewish population. But Israeli leaders have consistently claimed that they speak on behalf of all Jews since, in their view, the Zionist state somehow belongs to Jews around the world, even though these Jews exhibit no desire to move to Israel and are citizens of their respective countries. The claim to represent all Jews is politically empty, but is an effective tool to blur fundamental differences between Judaism and Zionism, and between Jews and the state of Israel. This claim therefore holds Jews hostage to Israel’s political and military behaviour. It is quite clear that anti-Jewish violence in Europe and elsewhere is fuelled by the conflict in Israel/Palestine. For the Zionists, this is a win-win situation because this violence breeds insecurity and destabilizes Jewish communities. This, in turn, results in emigration, some of it in the direction of Israel, a country that needs Jews in order to ensure a non-Palestinian majority there. Currently, Palestinians constitute a majority on the land controlled by Israel between the Mediterranean Sea and the Jordan River. What can bring about a just peace in Israel/Palestine, given the steady rightward trend of the Israeli electorate? Outside pressure. This is the consensus of Israeli peace activists. The Israeli government also understands this and is behind unprecedented legislation in several Western countries forbidding boycotts of Israel and its exports. Western governments permit Israel to act with impunity, but this policy suffers from a serious democratic deficit: citizens of most countries in Europe and North America view Israel very critically and consider it a threat to world peace. It is this grassroots pressure that may help Israel decide to embrace decency and peace. These viewpoints are not widely known here. Who published and who distributes your book? The publisher, Pluto Press of London, takes care of Europe; the University of Chicago Press distributes my book in the United States; and in Canada it is Brunswick Books. Whereas my previous book– A Threat from Within: A Century of Jewish Opposition to Zionism–has been translated into over a dozen languages, including Arabic and Hebrew, the new one has so far appeared in Japanese, French, Russian, and, finally, in English.